Samantha’s life is far from perfect, and her lifelong admirer wants to see her happy. But when strange forces seep into their small town, murder becomes the weapon of choice as these two teens flee for Cipher–not knowing of the invading army and horrors yet to come. And when Sam and Landis are separated, they are forced to become more than they ever thought possible. Book 2 in the Kallodhan Serial brings new meaning to Dark Fantasy as Wright plunges the reader into a world already tainted by familial anger and fear, and then dives farther and deeper into the bowls of evil. At first, I was taken aback by the hollow nature of Sam’s childhood friend and found myself despising this character who was supposed to be Sam’s “saviour”. But the more I thought about it, the more I realized that not every hero is “good”–that not every saviour has someone else’s needs in mind. And while I hesitate to call on terms such as anti-hero and reluctant-hero, I see Landis wanting to do the right thing for all the wrong reasons, and this rings true. We are selfish. We are base. He is “real” and just because he’s not what I was expecting, doesn’t mean that his character doesn’t speak volumes about this medieval society, and even what our society has reverted back to. I found the jump to new characters in this episode somewhat jarring. It would have been nice to have some hint of the thread yet to come in a prologue or discovered by another character in the early chapters–something that would be meaningless to them but meaningful to the reader who had been left “hanging” at the end of Book 1. Still, once the slight weaving of Book 1’s tale began to thread into Book 2’s, I was intrigued by the parallels, and delightfully surprised with the subtlety of the epilogue in clarifying this “Age of Becoming”. While I think this book exemplifies the epic nature of high fantasy and succeeds in dragging your soul through the depths of evil and its decay, as an editor I felt this indie book needed a touch more TLC–particularly in the copy editing department. And it is for this reason (as well as my general avoidance of stories mired by so much darkness) that the book straddles the star-rating at 3-ish. 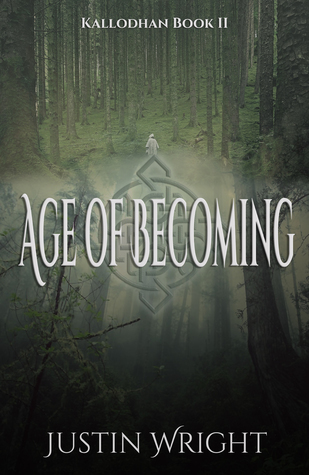 Regardless, “Age of Becoming” is a dark-fantasy reader’s happy nightmare as it delves into those black places most souls dare not tread.